Nothing screams summer barbecue like a good old fashioned cheese burger. But since the price of beef has increased it's nice to have another tasty and satisfying alternative. 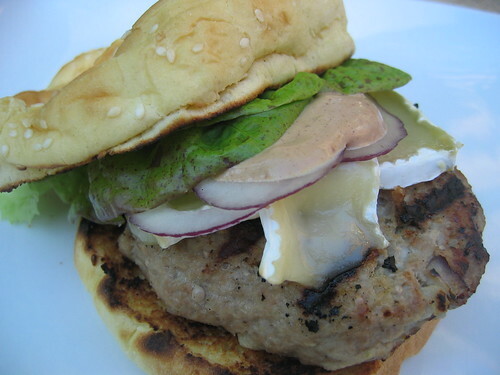 Many people wrinkle their noses at the thought of a turkey burger, as they are usually dry, boring and uninspiring. I'm hoping to change that perception - at least in my circle of friends! Asia met Washington State the other night when I created these delicious and juicy burgers. What ground turkey needs - especially turkey breast- is an ingredient that will not only add, but lock in, moisture in the meat. I've done this before with onion, but this time I went for the Triple Crown: red onion, green apple and fresh ginger. All ingredients providing moisture, flavor and texture. Apple Ginger Turkey Burgers 1 - 1.5 lb ground turkey breast 1 Granny Smith apple, grated with peel on 2" piece of fresh ginger, peeled (about 1/2 - 3/4 tablespoon) 1 small red onion, diced 1/2 tablespoon soy sauce Kosher salt and fresh ground black pepper Place the ground turkey in a large bowl. Crush the peeled ginger through a garlic press, and add the grated apple and diced onion. Add the soy sauce and a couple pinches of salt and a few good cranks of fresh ground pepper. Mix well with your hands, then form into patties (about 4-5). Grill a few minutes on each side or until juices no longer run red. Patties should feel slightly firm, but not hard. Great topped with Brie (shown) or sharp white cheddar. Looks yummy. Is that a slice of brie on top of the burger? I'm a burger fanatic, so I'll be giving this one a try soon! The best sounding burger I have ever heard of. I will definitely try this one soon. You're the best! crushed black pepper and sea salt. Wow! This is great. I love burgers. I'm suddenly craving for hotshots. Will send this recipe to my friend who is also obsessed with cheese burgers! Damn! That looks and sounds incredible! Okay, I'm fixing the fact that my email notice of Foodista postings broke when you guys changed the website. I am adding the RSS feed to Outlook right now! I've got some catching up to do on your postings... They are really fantastic. A sensational addition to turkey burgers - it was delicious. looks delicious! thanks for giving the recipe.. Need more of these healthy dishes ..